‘Who was Nellie Cashman?’ is a question frequently raised by people when discussing this monument. Hopefully the question will be answered on Thursday. For decades there was only on solitary public monument in Midleton – the Clonmult monument that marks the northern end of Main Street. In 1998 a second monument was added just a couple of meters from the Clonmult Monument. Then in the early 2000s came the Gyrator on the site of the former Goose’s Acre, again, not far from the Clonmult Monument. From 2014 to 2015 Midleton installed FIVE sculptures or monuments, four of them in the area around the Clonmult Monument and one isolated in the park on the Bailick Road. This latter is dedicated to the Choctaw people who donated $170 of their very scarce and hard earned money towards Irish Famine Relief in the 1840s. There can be few other towns in Ireland with such a number of public sculptures or monuments, but the townspeople know very little about them. Indeed the discussion has generally been about the large sum of money spent on them. This raises questions about their quality as public art. The magnificent ‘Kindred Spirits’ by Alex Pentek. Situated in Bailick Park, it is dedicated to the Choctaw people who made a donation to Irish famine relief in the 1840s despite their own poverty and tragic history. On Thursday, 26 November, at 1.00 pm in Midleton Library I will present a free public lecture on these monuments and public sculptures, with the emphasis on the history of the monuments, of the characters and events commemorated by them, and some consideration of their artistic merits. The aim is to move the discussion away from the money spent on them to the appreciation of their role in the town. As a lunchtime lecture the presentation will take 45 minutes at most. All are welcome. Midleton Endowed School: the King, his Mistress and her estate – a tale of delayed expectations. Midleton College’s original building is the right-hand part of the facade shown above, completed in 1717, over two decades after the school was founded in 1696. The wing on the left was erected in the nineteenth century. 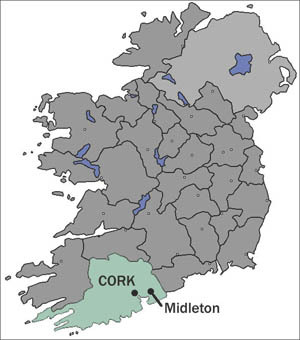 The second oldest establishment in Midleton, apart from the church, is Midleton College, which was founded as Midleton Endowed School in 1696. Still flourishing today, the college has outlasted other schools founded in the seventeenth century, but was nearly lost in the early nineteenth century because the Headmaster simply let the school decline. The founding of this school is wrapped up in the aftermath of the Williamite War or War of the Three Kings between James II and King Louis XIV of France on one side and King William III (of Orange) on the other side. The story however begins much earlier in 1677, when the elder daughter of James, Duke of York, was married off to her first cousin, the Prince William of Orange-Nassau, who had become Stadholder of Holland, Zeeland, Utrecht, Gelderland and Overijssel some years earlier. It seems that William hoped to inherit the English crown following the death of his father-in-law, James, given that there were no surviving princes in the House of Stuart. James, Duke of York, father of Queen Mary, was overthrown by his son-in-law William of Orange in 1688. It was the private estate of James, granted by Charles II in 1660, that provided the lands that endowed Midleton College from 1696. The Princess Mary was accompanied to the Hague by her maid of honour Elizabeth Villiers, who soon became William’s mistress. However, William’s accession to the English throne came about in very dramatic fashion. James Duke of York became King on the death of his older brother, King Charles II, in 1685 and proceeded to upset hardline Protestant opinion in his realms by his tolerance of Catholics and Dissenters. In 1688, after much preparation and manipulation of English political opinion, William invaded England with a fleet and force far greater than anything the Spanish had employed a century earlier. James fled to France and later came to Ireland to recover his throne. William, and his wife Mary, were made joint monarchs and William soon came to Ireland to defeat his father-in-law at the Battle of the Boyne in July 1690. Although William left Ireland soon after the failure of the siege of Limerick (1690), he was already beginning to distribute confiscated Irish lands . The entire private Irish estate of James II was given to Queen Mary and may have paid for some of the furnishing of Kensington Palace, which Mary was building at the time. This estate, created by King Charles II in 1660, brought in about £24,000 per annum and was quite a lucrative addition to Mary’s income. With Mary’s death in December 1694, her sister Anne would have expected to inherit their father’s Irish estate, but William granted it to Elizabeth Villiers, his now former mistress. The grant to Villiers upset both the Irish and English parliaments who wished to sell off the estate to pay off some of the debts of the crown. In order to mollify parliamentary opinion, Elizabeth sought the legal and political help of the Brodrick family of Midleton. With their help, Elizabeth Villiers decided to found an endowed school in Midleton, on land granted for the purpose by Sir St John Brodrick. His elder son, and heir, Thomas, was appointed to the board of governors of the school, along with Elizabeth’s brother-in-law, Henry O’Brien, Earl of Inchiquin, who resided at nearby Rostellan. 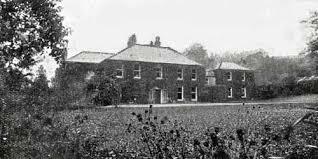 In addition, Elizabeth appointed Alan Brodrick and his brother-in-law, Laurence Clayton of Mallow, as trustees of the lands she set aside from the her new estate to provide an income for the school. Thomas Brodrick was also charged with the actual building of the school itself. One might have thought that the construction of the school would have got under way at once. But the parliamentary dispute over the grant to Elizabeth Villiers precluded this – everything was held up until the estate could be finally settled. In the end, the English parliament confiscated the entire estate to sell it off to pay the Crown’s debts in 1700. However, the Brodricks had sufficient influence at Westminster to preserve the endowment lands for the school – these were specifically excluded form the confiscation but it wasn’t until later that an income could be secured from the lands to pay for the school. Half of these lands were first let in 1710 and the remainder being let in 1712. It was only now, with an income secured from the school endowment that Thomas Brodrick could begin to draw up plans for the building of the school, which was certainly completed in 1717 with the appointment of the first headmaster, Rev George Chinnery. Thus, over twenty years after Elizabeth Villiers had endowed the school, it opened for business. The delay was caused by the political row over the fate of James II’s private Irish estate which provided the original endowment for the school. It was the Brodrick’s astute political skills that allowed the school project to go ahead and give Midleton its second oldest institution after the parish. Glounthaune, formerly New Glanmire and Queenstown Junction (updated). Ashbourne House in Glounthaune could have been lost in the 1960s. Fortunately it was acquired by the Garde family who rain it into a small hotel and who also maintained the gardens for the enjoyment of their guests. Despite being sold in the year 2000, it is really thanks to them that the house and gardens survive today. I’ve updated the post on Glounthaune, formerly New Glanmire and Queenstown Junction to take into account some new information from Mike Garde in respect of the later history of Ashbourne House which became Ashboure House Hotel in 1960. Mike’s family preserved the house and the gardens developed by Richard Beamish at a time when so many of these houses were demolished as too expensive to maintain due to the high council rates. They were also considered too old fashioned, lacking the modern conveniences of running water and modern conveniences. As it was, the auctioneer had removed and sold off some of the plants from the gardens before the Gardes managed to acquire Ashbourne. Without their intervention and care from 1960 to 2000 it is likely that the house and gardens would have been entirely lost or, at best, severely damaged. There is a more detailed history that could be written about Ashbourne after Richard Beamish’s occupancy. I’d like to thank Mike Garde for alerting me to the new information!